This Review has been published in the special Issue Zebrafish: The Key for Cancer Treatment of the journal GENES. 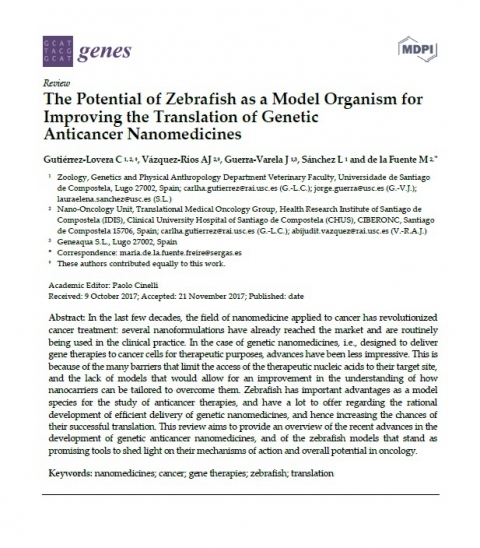 Titled The Potential of Zebrafish as a Model Organism for Improving the Translation of Genetic Anticancer Nanomedicines this publication is completely free online. Authors: Carlha Gutiérrez-Lovera, Abi Vázquez-Ríos, Jorge Guerra-Varela, Laura Sánchez and María de la Fuente. Abstract: In the last few decades, the field of nanomedicine applied to cancer has revolutionized cancer treatment: several nanoformulations have already reached the market and are routinely being used in the clinical practice. In the case of genetic nanomedicines, i.e., designed to deliver gene therapies to cancer cells for therapeutic purposes, advances have been less impressive. This is because of the many barriers that limit the access of the therapeutic nucleic acids to their target site, and the lack of models that would allow for an improvement in the understanding of how nanocarriers can be tailored to overcome them. Zebrafish has important advantages as a model species for the study of anticancer therapies, and have a lot to offer regarding the rational development of efficient delivery of genetic nanomedicines, and hence increasing the chances of their successful translation. This review aims to provide an overview of the recent advances in the development of genetic anticancer nanomedicines, and of the zebrafish models that stand as promising tools to shed light on their mechanisms of action and overall potential in oncology.